It’s often said that Nosework is an activity for ALL dogs. I’d like to explore that a little and share with you WHY that’s a true statement. Other sports seem to gravitate to certain dog types. Dogs who enjoy running, jumping and expressing themselves through motion tend to enjoy agility. Dogs who enjoy close up interaction and focus on their handler, tend to enjoy obedience. Dogs who enjoy swimming, retrieving and a release of quick adrenaline like dock diving… the list goes on…. But what kinds of dogs like nosework? The answer is in fact, ALL dogs. What you will find is that each type of dog will get something entirely different from the activity. Note that I’m calling this an activity in this context rather than a sport. That’s very deliberate language. There is a difference between the activity of nosework and the sport of nosework. The activity is therapeutic in many ways and is the expression of the sport in a non-competitive environment. The sport is the manifestation of the activity in a competitive environment. Many dogs will end up on the competitive journey, and some will simply benefit from the activity itself. Competition isn’t for every dog. The ACTIVITY is for every dog. You have to make the decision regarding competition separately from the decision regarding the activity. We say that this is an excellent activity for every dog because of the benefits that can be derived from participation. We can break this out into (1) the benefits of sniffing and (2) the benefit to the individual dog. This blog focuses on the benefits of sniffing. Sniffing activates something called the Seeking System part of the brain. It’s a part of the brain that is also responsible for the release of the neurotransmitter called Dopamine. Dopamine increases our level of arousal (attention), feelings of motivation and reward and related to an enhanced memory. Dopamine feels good. So every time you let your dog sniff, you are allowing the dog to feel good. This is self soothing and can lower anxiety. The dopamine D1 and D2 receptors are important for regulating anxiety. So the simple act of sniffing can physically reduce a dog’s anxiety or discomfort. When you couple the anxiety reduction with the stimulation of the Seeking System you get a perfect storm of benefits for the dog. Imagine a feel good, anxiety reducing, enriching activity… and you imagine sniffing. When we add the element of reward into nosework, we also stimulate the Seeking System because the dog is seeking a resource, in this case, a cookie or a toy. When target odor is employed, the dog is still seeking a resource. With target odor, the dog understands that the result will be a reward. Interestingly, the simple fact that we have stimulated the Seeking System actually reinforces the learning process! 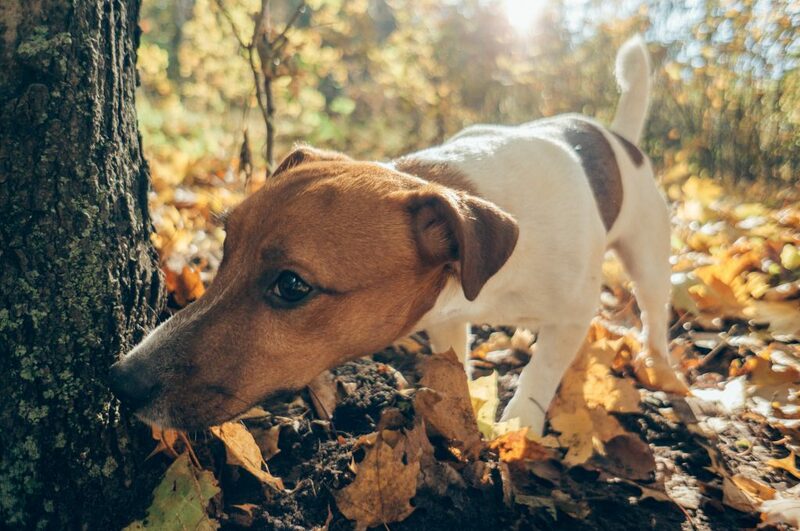 Sniffing, especially sniffing in the context of Nosework, is therefore a pivotal therapeutic activity that can stimulate feel good feelings and lower anxiety. Sniffing is essential to a dog’s happiness! Another wonderfully intelligent article from Stacy. WOW–what a boon this website is to this “activity” and sport we love! When starting a search, I’ve always told my dogs, “Go sniff!” I’m really glad that was my choice because now I see they ARE doing so much more than searching! –I love the point Stacy makes about the intrinsic value of the activity. And I appreciate Kirstie’s comment about the value in letting her dog sniff during walks. Thank you, Stacy! Sounds like the perfect thing to join with my puppy. He is ALWAYS sniffing everything. This is a FANTASTIC course for puppies! I would love to have this article as a pdf so I could share widely and give credit due. I’ll use the link for now. Thank you, so much of what you do and share is very helpful to many people and so many dogs.